Were you able to read my blog post about Tarlac and why I love it? I told you the many reasons why I love the place and why I keep coming back. If you remember, I told you the main reason why I keep coming back was because of my grandfather. He was bed-ridden so I wanted to spend more time with him. I was able to spend time with him since December 2014. Unfortunately, though, he was rushed to the hospital last July 26, 2015. He was having hard time breathing so he was admitted. We (I) thought he was going to make it back home after 3 days. I even asked him when we'll go back to our home and he said Wednesday. I asked him what time, he said "Earliest time on Wednesday." I was positive he was going to make it healthy by Wednesday since he was fine on Tuesday. But at 3 AM on Wednesday, July 29, 2015, I got texts from his caregiver saying my Lolo was already gone. He was not able to make it. I made it to the hospital at 3:30 AM... I did not cry when I saw him. He was still soft and had little warmth to him so I shook him and told him to wake up. But he didn't. A few moments later, he showed signs of... not being alive anymore... My lolo was a man of honor. He always kept his words and promises. Until the last day, he kept his word. He left "earliest time" on Wednesday. Anyway, we got busy on that day since all his children were in the USA. I am the only grandchild here in the Philippines so I had to help with everything. Good thing, we have kind relatives here in Tarlac that helped us as well. We waited for my uncle that came home from the USA on Friday. At first, they wanted to hold the wake at a funeral house. There were lots of talks... but in the end, our family decided to just have it at our home. That was Lolo's wish, anyway. Another son came on Saturday then two more of his children came home on Sunday, that includes my Dad and my half sister. The last son that came home arrived Monday night. Then, 3 more grandchildren from the USA came on Tuesday. It was a 10-day long wake. I have never seen a wake as long as that. Everyone was busy; preparing all the documents, going to the grocery, cooking food, entertaining Lolo's visitors... But would you believe that those 10 days were so fun? I know the reason behind the fun was sad, but since the wake was held in the province, a lot of people came. A lot of people stayed up late with us, drinking coffee and munching on biscuits. A lot of people were outside, playing cards, mahjong and bingo! It surely was fun. It didn't seem like a wake but rather like a family gathering. A lot were sad but I am sure my Lolo was happy to see us get together like that again. He was bed-ridden for 3 years so he was not able to join and enjoy family gatherings anymore. I don't really want to make you all sad by telling you this story. But who knows, maybe when I go back to Manila, I might miss him like crazy and might decide to edit this blog post. But right now, I am just thankful I became my Lolo's granddaughter. 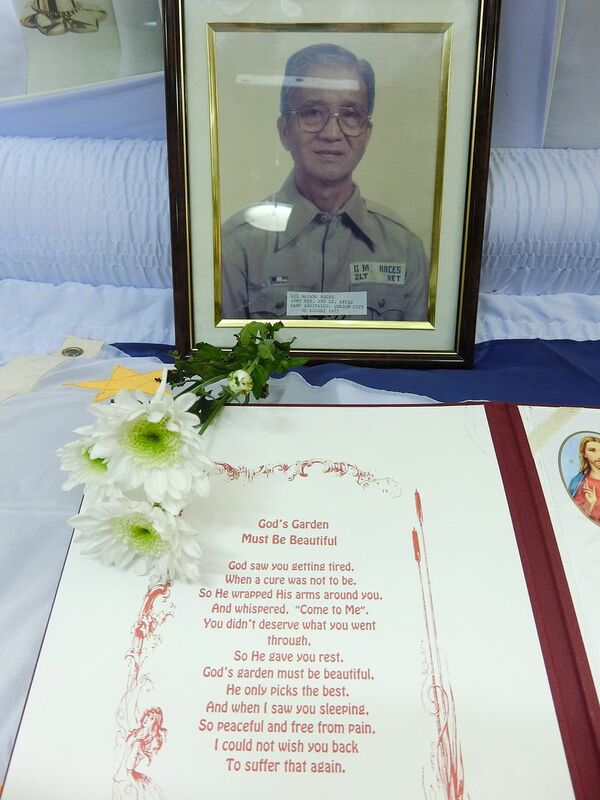 He taught me a lot of things and was one of the people that really made me feel welcome and loved in the Roces family. Lolo, I will miss you! I love you! So, that was why I was gone for weeks. I remember my Lolo was in the hospital when I was editing the SNSD SeoHyun Hair Tutorial. I was there with him, editing the video. When he passed away, I was not able to edit any of my raw videos, do the blog posts I was about to do and was not even able to check my e-mail. I am sorry that I was gone but I hope you guys understand. I am still here in Tarlac because my father is here for a month so I want to be able to try and spend some time with him... I will try my best to update our YouTube channel and this blog often now. Thanks for patiently waiting and thank you for reading this blog post. It only means you came back even though you saw that I was gone for weeks.